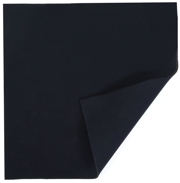 This sheet of Neoprene is high quality and is single lined with stretch nylon on one side. The other side is smoothskin shiny finish. CR Neoprene in a high quality grade with a higher degree of stretch than SBR grade.